Location coordinates derived from geographical map (like Google, Bing, Yahoo Maps) can be expressed in different formats. For example: it can be in DMS (Degree Minute Second) or decimal format. 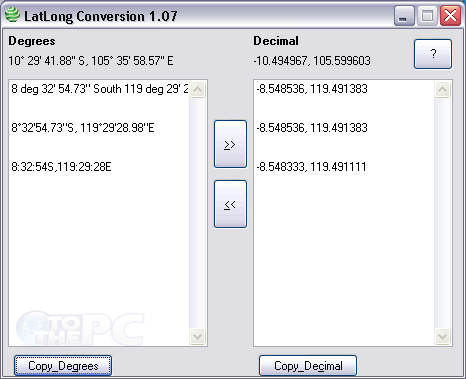 Do you want to convert coordinates from Degree Minute Second to Decimal format or vice-versa? Portable tool LatLong Conversion makes this all easy and quick. 1. Download LatLong Conversion [source]. Double click to launch it. 3. Then click >> to see equivalent values in decimal format. Alternatively, you can enter co-ordinates in decimal format in right window and click << button to view equivalent values in degree format. Simple and useful tool!